Enabling Google Plus comments system in Blogger can, in fact, boost more user engagement rather that of default Blogger comment platform. Google+ is a social networking site that lets you integrate with other Google related products and lets you share your posts, video chats, etc. Google+ has become a large question mark for many bloggers and small business owners as well and wondering why you should care about Google+. Google loves Google and by sharing pages from your blog or website on your Google+ page, you will help your blog rank higher in the Google search engine. One of the great things about Google+ is how new it is. With a smaller audience to reach out, you can easily begin to build a relationship with influencers. Using Google+ circles you and can place your followers into categories similar to email lists. This allows you to send your piece of content to your entire audience or specific circles of your choice. Enabling or integrating Google plus comment system actually has some effective features. So, let’s take a look at some of the major pros of having Google+ comment system on your Blogger blog. Unlike the Disqus comment system that uses Facebook login details in order to leave a comment. Google plus uses your Gmail account. So, when you share your content on Google + and your readers leave a comment, it will also show up under that particular posts too and thus you will have more comments. Google+ comment system has a special feature that will let your visitors choose whether to make their comment private or public and hence, it is more user-friendly. Google plus allows users to modify or delete their comments even after publishing also and due to its user-friendly nature and flexibilities bloggers, as well as readers, love Google plus comment system. Google plus comments contain a checkbox that allows an individual comment to share on Google + platform while publishing their comments. And also, they are able to show their feedback on any of the comments using the Google (+1) button. Nowadays, spam comments have become more common and it is disturbing as well. As technological innovations are increasing people are using automated comment bots, etc. in order to comments on blogs. Enabling Google Plus comment system in Blogger is very easy, just follow the below steps and you will be done within no time. 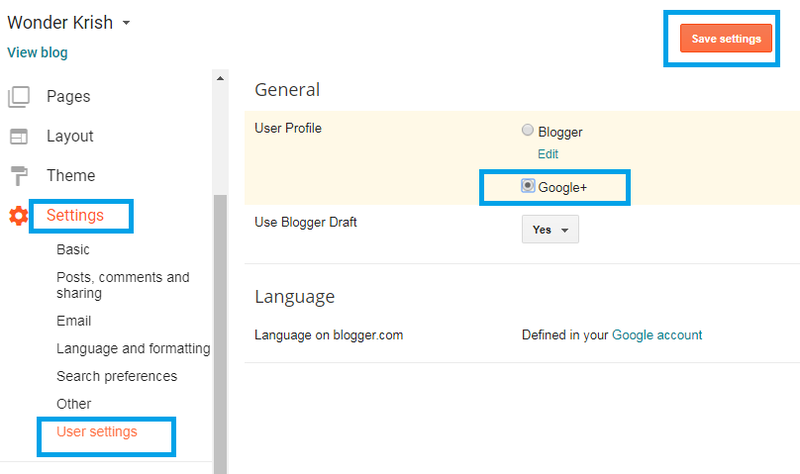 You must use your Google Plus account as your Blogger profile so to enable Google plus comment system on your Blogger blog. But if you already have one, then you can directly enable Google + comments system. Step 1. Login to your Blogger blog and Click on Settings and select User Settings. Step 2. Select Google+ as shown above and on the top right corner click on Save settings in order to save your settings. Step 3. Then click on Posts, comments and sharing option and scroll down and change Use Google+ Comments on this blog from No to Yes as shown in the below image. Step 4. Click on Save settings and you are done. I hope this tutorial has helped you to successfully integrated Google plus comment system in your Blogger blog. And if this tutorial has helped you or have any opinion, share your feedback by leaving a comment below.